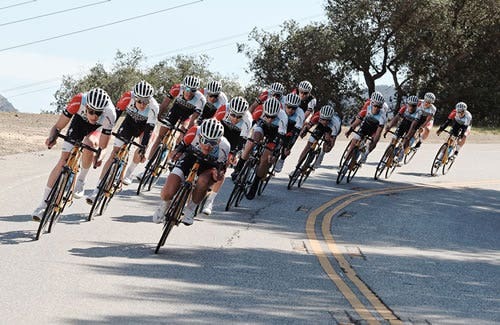 Founded in 2009, Hagens Berman Axeon is a UCI Professional Continental cycling team based in the United States. Wahoo Fitness is committed to the future of professional cycling through a sponsorship of Hagens Berman Axeon Pro Cycling Team, who will be racing with Wahoo devices in 2018. 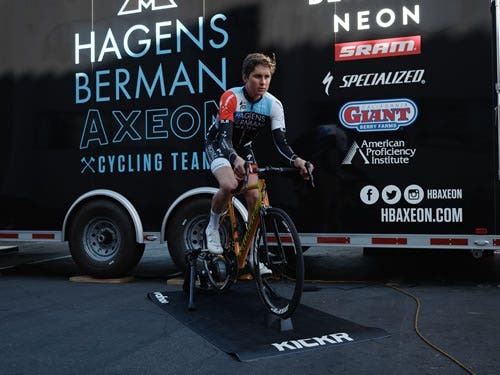 Now in its tenth season as a professional cycling development program, Hagens Berman Axeon remains under the ownership and direction of former Belgian National Champion, Axel Merckx – son of five-time Tour de France champion Eddy Merckx. A: William Barta: Chasing the data. Michael Rice: A cyclist with interest in an accurate and reliable way to record training data. Jonathan Brown: Using the best bike computer on the market. Ian Garrison: That I'm a part of Wahoo family and I wouldn't be able to do my job without my ELEMNT BOLT! Jasper Philipsen: The will of doing always better. Michael Rice: Probably winning the u19 Australian Road Race Championship. I think this was a significant turning point for me to chase my dream of making a career in cycling. Jonathan Brown: As a 17/18 year old junior I was able to win the national road race both years. The only junior in U.S. history to win both years. Ian Garrison: Hitting the finish ride button every day. 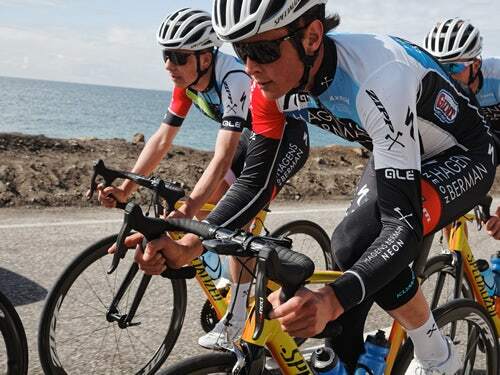 A: Maikel Zijlaard: Winning the U23 Tour of Fanders. Michael Rice: Stage win at 2017 Redlands Bicycle Classic and Stage win 2016 Tour de Beauce. Jonathan Brown: As a U23 sometimes not all accomplishments are winning a race. For me, my biggest achievement was being able to do the Tour of Utah in 2017. It is a dream for us to race against the biggest teams in the world and I got to line up against them for a whole week. A: William Barta: I always take a shower before the race. Michael Rice: Not really. I do like to pin my numbers the night before a race. Jonathan Brown: Every race I do a few small things that are always the same. I pack my bag the night before and have everything in my race bag in exact spots. The morning of there is only one thing I do. No matter the race I just stay calm and remember why I race bikes. Its something that I love doing and I am living a dream. I just take it all in. Ian Garrison: Listening to music. A: Maikel Zijlaard: Have fun. Keep going. Battle yourself. Michael Rice: Have fun. Explore the roads less traveled. Be consistent. Jonathan Brown: 1. Firstly, as a cyclist stop messing with your position. Changing everything by millimeters all the time isn't helping you and you are just in your mind all the time. Go get a good bike fit and once they give you a fit stick with it. 2. I would say a tip for younger athletes in general is remember why you are doing your sport. You should always be enjoying it and sometimes its alright to be a young adult and not do everything "perfectly." 3. STOP EATING LIKE CRAP. You know as athletes you think since you are exercising so much you can "eat whatever you want" because you are burning calories. Yes, true you are burning an excess amount of calories, however, you should fuel your body with real, WHOLE foods. Our bodies are already full of inflammation as an athlete, so why add more onto it from eating processed foods. Zeke Mostov: Have fun, do a consistently mangeable amount of work, and surround your self with positive people. Jasper Philipsen: Do good trainings but take your rest. Try not to focus to hard on the planned workout. But enjoy the rides with good company. William Barta: I am always motivated by putting my best out there. Obviously as a competitor the ultimate motivation is winning; whether it be myself or a teammate. I also draw lots of motivation from all the people who support me such as my family, friends, girlfriend and team. Michael Rice: I keep investing the hard work to be the best that I can be. Jonathan Brown: Since I was a young kid I have always wanted to be a professional cyclist. Sometimes I think back to when I was younger when i'd dream of winning some of the monumental races. Now i'm in that position to do so, which makes it easy to keep pushing myself to make childhood dreams a reality. William Barta: I love how simple it is to use, while still doing everything you need it to. Michael Rice: Its user friendliness, so easy to navigate through the app to customize settings. Jonathan Brown: I love my Wahoo ELEMNT the most. I'm never very good with technology and this has been the easiest most user friendly bike computer on the market. Ian Garrison: It's made by cyclists for cyclists. It has everything you need and nothing you don't. Jasper Philipsen: Greatest and easiest to use bike computer I've had so far.